Quite useful little herb; but, as you can see, it will color a variety of mediums, so use caution while working with it. I wore gloves while straining the herb from my oil–just to be safe. To work with this root, I first placed two tablespoons of dried, chopped root, in a small glass jar with a tight-fitting lid and I covered it with olive oil. I shook daily for 2-3 days and strained. The resulting liquid was dark, purple-y, and to DIY nerds like myself; truly inviting. If we’re all being honest here, this is the blog post that almost wasn’t. Creating this recipe gave me such heck. (I have some other choice words for it, but since this is a lip tint for ladies, I may as well play the part, eh?) I wanted a *perfect* hardness, and it took a few tries to achieve that. Probably would have been smarter to do a test batch, but, that’s not how I roll. I’m a wild woman…err, lady…Needless to say, I was a bit hesitant to pass on a recipe I didn’t feel absolutely 100% positive about the measurements, but, I did my VERY BEST to keep track of the kitchen madness for you guys. It felt criminal not to share, because the end result was completely phenomenal, exceeding all of my expectations!Why didn’t I just recreate this beauty? Well, because this recipe made about 15 or 18 tubes, and I think I’m good on lip tint for a while 🙂 So, there you have it, folks. You’ve been warned. I used a blend of lavender, rose geranium, ylang ylang and lemongrass. If you’re just getting started and want to build your stash, check out these awesome sampler kits you can play around with! Combine all ingredients in a small double boiler over medium heat until melted. 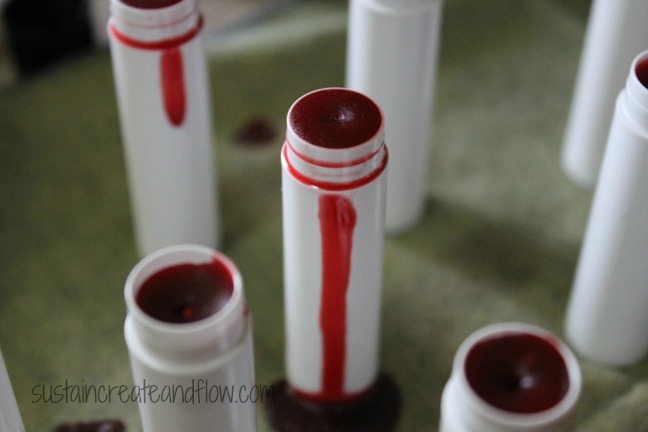 Decant into lip balm tubes, (find them here), and allow to fully cool and harden before use. Makes some for you and some for your envious girlfriends. Although the end result is a moisturizing lip balm with a stunning shade of ruby, it does not apply even close to the color in the tube. It’s a lip tint, not a lip stain or even lipstick. 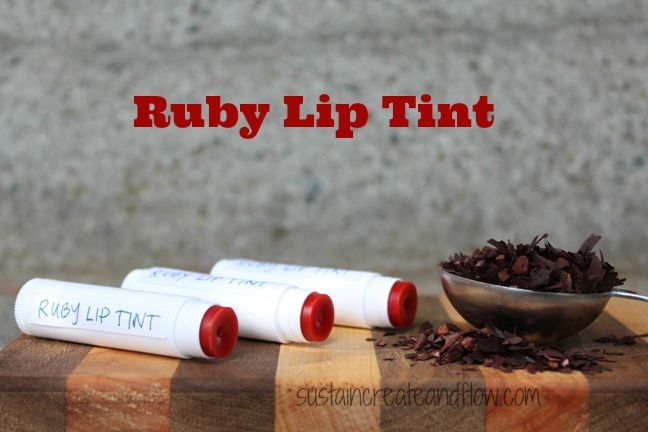 It enhances your lips’ natural color, and fills in with a wee bit o’ color where needed. (Similar to Burt’s Bees tinted chapsticks). For me, when I use it, I feel like my lips have the lovely rosy hue one gets after a day at the beach. Score. I love your love for nature and being all natural. Happy days with that online course. Excited to hear what you learn. could the alkanet powder be substituted? instead of all the work of steeping the root? thankyou. blessings . soulful returns. I’m sure it could. Ive just not done it before do I have no idea on how to advise you. I am one of those odd people that actually enjoy infusing 🙂 Please let me know if you try it! A useful tip for life, thank you for sharing.